With Apple's media event still four days away and the launch of new iPhone hardware likely two weeks away, campers are already starting to line up at the company's flagship Fifth Avenue retail store in Manhattan. While early lineups are frequently done as promotional stunts rather than campers arriving simply as devoted fans, with some early campers at past launches even receiving sponsorships to promote brands while they wait, it seems that the bar is continually being raised with campers now arriving even before Apple has announced anything. 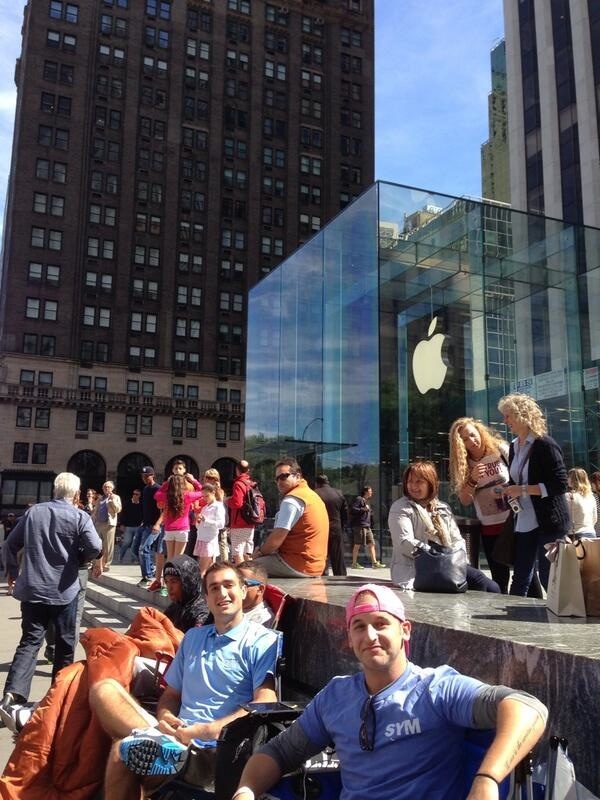 Two representatives from Cincinnati-based SellYourMac arrived on the scene today to begin what they hope will be a two-week campout, only to find that they were not the first people in line at the Fifth Avenue store, which generally serves as one of the most high-profile launch sites due to its iconic design and 24-hour operation. Two other campers claimed their spots at the front of the line last night, settling in for the long wait. According to Sell Your Mac's Jon Murphy, the campers have yet to have any discussions with Apple's store staff about their plans, but the line is forming in its usual spot on the plaza outside the store's landmark glass cube. Apple's media event is scheduled for next Tuesday, with rumors and speculation pointing to a launch of the iPhone 5S and 5C in the United States and other first-wave countries on Friday, September 20. Guys... this isn't 2007/8 anymore... you can order your iPhones online and have them on your doorstep on launch day now. No problem guys. Well work for you to live off our earnings. I'm hiding in a box in the back room of the store. Makes no sense. These people are either unemployed & on benefits (and are therefore having their iPhones payed for by us) or are using their vacation time to spend a fortnight outside a feckin' building? -Students who are living on mom & dad's dime. -Independently wealthy folks with nothing better to do. -People who work from home and can take it "on the road" (or "on the square"). In related news, the average IQ in the US just dropped 5 points. How can we be sure they're not lining up for the iPhone 6?